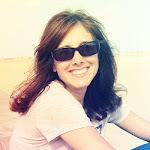 I'm on a roll with my posts this week! Guess I have a lot to say. Ha ha. Before I share my cards, I just have to ask, does anyone else hate the styles that are out right now as much as I do? I went shopping the other day and UGH! Please tell me who decided that it was a good thing to bring back skinny jeans? And black, teal and purple plaid flannel was ugly the first time around, why am I seeing it again? I lived through the 80s and the horrendous styles once. I don't need to do it again! I feel like an old lady complaining about stuff, but REALLY! I had a hard time finding anything I liked. Here are a couple of cards I did for challenges this week. This first one is for this week's 2 Sketches 4 You based on Kazan's sketch. My brother's birthday is on Saturday, so I made this one for him. It was really hard for me to stay away from soft, flowery things, but I like how it turned out. 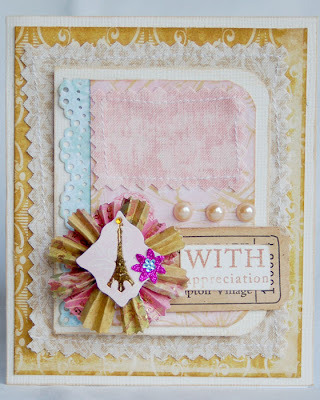 I used some MAMBI star stickers, and Jillybean Soup, Bo Bunny, Best Creations and October Afternoon papers. This next card is based on this week's Card Patterns sketch. I haven't had the chance to play along with them before, so I'm excited that I was able to this week. I used some Webster's Pages papers, fabric and a K&Co. flower. The tag is vintage and the stamp is Papertrey. 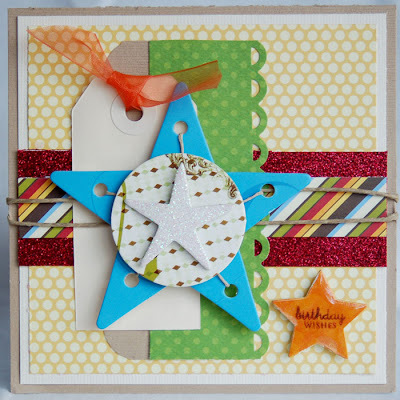 I love the star on your first card and the second has lots of great layering! Both are beautiful! you did fabulous with your brother's card...so fun!! I find it so hard to stay away from the feminine things, too. Your second card is just divine! I have to agree on the styles...just not for me...skinny jeans...please! Oh, and I agree- totally hating the fashions out right now. Yes, leggins were cool in junior high, but NOT now! Ugh! Love the birthday card for your brother, Anabelle! It's so fun with the twine and bright colors! 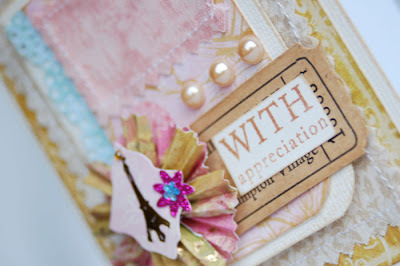 Your "with appreciation" card is so lovely...so very feminine! Love the Webster's Pages papers and fabric together. Beautiful work as always! Um yes, 80's styles were bad enough the first time around. I fear the return of big hair! Love your masculine card! The lack of soft and flowery did nothing to dampen your talent. And, of course, the second is just stunning! When the skinny jeans and bright 80's colors started to come out the first thing I said was "what next, leggings?" What did I see in the store the other day leggings. Truly aweful and it makes me feel old for not liking the new/old style. So does that make the style out of date or me? Love your cards too, but I just wanted to hop on your soapbox for a bit. And I agree with you--its like my childhood coming back and it wasn't good fashion the first time around! LOL! Lovely cards i like the star. These of course are fabulous! Thanks for playing with us at Card Patterns! Such wonderful cards girl! Love them both! Your cards are absolutely Darling. Thanks for playing with us. 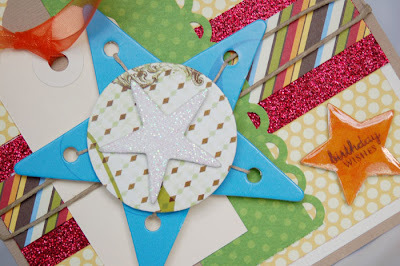 Gorgeous cards ~ love the star one! YES! I totally agree with you about the skinny jeans...whose idea was it to bring those back? I'm def. staying away from those! =) I did buy a plaid shirt, but it was just brown tones, no purple! Your work is absolutely beautiful. Congrats to you!! !